There were a lot of good things to take away from last night's 3-1 win over the Columbus Blue Jackets. First and foremost, it stopped a five game winless streak for the Buffalo Sabres (0-4-1,) which was their third such streak of five or more games (one was six) on the season and it sent them into their 'bye week' on a positive note. Which is important. The altercation at Wednesday's practice between defenseman Justin Falk and winger Evander Kane actually may have helped the team as the frustrations of a long, trying first half of the season boiled over. Maybe it was their Festivus, with the thoughts and emotions of an entire team in the throes of a losing season came through in these words from Falk, “Shut the (expletive) up, you selfish (expletive),” as reported by those on the scene. Although Falk wasn't speaking for the entire team in directing his ire towards Kane, God knows there had to be plenty of things bothering them and that eruption may have relieved a lot of pressure. 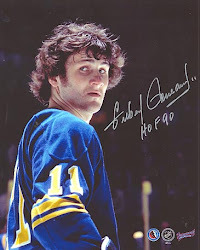 It was said to be an "angry practice" by long-time Sabres beat reporter Paul Hamilton of WGR550 Radio who also said that most of it dealt with head coach Phil Housley finding many teaching moments while expressing his desire for more passion. And that's what he got. Housley's Sabres, who've had notoriously slow starts in most of their games this season, came out and stuck it to Columbus in the first period last night. Buffalo outshot the Blue Jackets 15-11 through the first 20 minutes while controlling most of the play and left the ice with a 1-0 lead as forward Benoit Pouliot, who'd not scored a goal in nearly a month, pounced on a rebound off of a Kyle Okposo shot. Pouliot became the most recent beneficiary of being placed on Jack Eichel's line while Okposo has been enjoying those benefits with two-points (1+1) last night and five (1+4) since moving up with Eichel two games ago. Rookie defenseman Brendan Guhle also got in on the scoring last night as he notched an assist for his first NHL point. The bright-eyed and bushy-tailed 20 yr. old has been a breath of fresh air for a Sabres team that's been slogging through much of the season. Guhle was terrific while bringing much needed speed and energy to the team from the back end and was rewarded with a secondary assist when Kane's dump-in took a weird bounce and an unchecked Okposo buried and easy goal into a wide open net. But the star of the show, and the game's first star was goaltender Linus Ullmark who was making is first NHL start of the season. Ullmark turned away 44 of 45 shots faced and was only beaten by a ridiculous backhand by the Jackets' Artemi Panarin with the Sabres shorthanded. 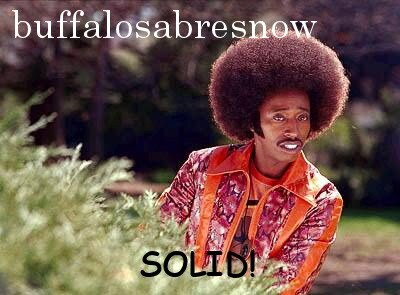 Other than that he was solid. Ullmark credited his team with keeping many shots to the outside, but he was challenging shooters all night and when he needed to come up with a big save, he did. "He's very calm. He doesn't overplay things," said Housley at his post-game presser. "He's pretty tight. He's pretty square to the puck and he makes that first save. He fought through some traffic then he made the second save. He stepped up, he was really on his angle and challenging and you could see the confidence in his game." Confidence is the key word here. Housley also used it while describing Guhle's game and the reason both of those two have played in Rochester the entire season before this week is so that they can develop further and build more confidence in their game. Ullmark is amongst the leaders in every AHL goaltending category this season and was named to the AHL All-Star team while Guhle is tied for second amongst rookie defensemen in scoring while playing in all situations for the Amerks. It was a good win last night for Buffalo and both Guhle and Ullmark give Sabres fans plenty to look forward to next season. Lest we start planning the parade, it was just one win and just one game and often times players have been known to fade, such as we've seen in Buffalo a number of times already this season. But it was a win which they can take into their five-day 'bye-week', which is much better than the alternative. Eichel's empty net goal last night was impressive and there's not many times when you can say that about an empty-netter. With the Sabres under pressure and less than 10 seconds to play Ryan O'Reilly intercepted a pass in the slot and fed Eichel to his right. After taking a few strides in his own zone Eichel wristed a rocket that went 125' in a second and hit a bullseye dead-center into the open net about three feet up for his 18th goal of the season. It's not very often you see a goal from that far away sent with that much authority and that much accuracy. Good for him too. Eichel has been on a tear lately. It was his second multi-point game in a row and now has 10 goals and seven assists in his last 12 games. His 41 points (18+23) lead the Sabres and places him tied for 23rd in the league while his 17 even-strength goals are tied for sixth. Eichel has only one powerplay goal, but his four empty-netters are second in the league only to Michael Grabner's (NYR) six. Defenseman Zach Bogosian was a casualty of Wednesday's "angry practice" and will be sidelined long-term (I know, and the sun came up today.) With him out of the lineup, the question of whether the team will recall Guhle (who was sent down to Rochester along with Ullmark today) after Buffalo's bye came up. "Are they going to be ready? Because it's that balancing act come next Fall when you ideally want them in the National Hockey League, but you have to be careful of putting them on the roster in a situation where they're failing." As for the rest of the season, the hosts asked Botterill if Guhle and Ullmark will come back to Buffalo after their bye. "Both will be sent down (and they were this morning) and they'll be in Rochester for the week and we'll re-evaluate the situation once we start up again next week. "It's a scenario where we brought up [Ullmark] for precautionary reasons," said the GM, "but we tried to find a game for him (which they did last night.) With Guhle, he's done an outstanding job throughout the year and we felt like it was a situation where we could get him in for a couple of games, see what materializes and make a decision further from that." Botterill was effusive in his praise for both those players, and from what we've seen of their play not only these last one or two games, but the progress they've made from their previous appearances in Buffalo, it wouldn't be too surprising to see both of them in the Sabres lineup again this season. Ullmark has made great progress since playing in 20 games for the Sabres as a rookie in the 2015-16 season and Guhle looked like he belonged as a junior call-up last season and in these last two games he's done nothing to make us believe that he doesn't still belong. Finally, back to Wednesday's altercation at practice. "What I mean by 'excited about it' was that [Housley] has been demanding more compete, more battle in practice. We think, for us to take another step as an organization, we have to score more in practice. We have to compete more in practice. We have to win more one-on-one battles against each other in practice. From our standpoint, [what happened Wed.] was good to see."